Do you remember that book, A Very Young Dancer, by Kill Krementz? Apparently it was quite an influential book for all my sisters and me. I was looking at a copy while we were visiting my sister last weekend, and it's especially interesting to read again as an adult; the little girl in the book danced the part of Marie for George Balanchine in his version of The Nutcracker, for Pete's sake! What a dream come true! This book inspired me to take ballet lessons, which I pursued well into high school. But dancing en pointe is an insanely painful experience, and while I still love to dance (I love barre work especially and wish I still had time to take classes), I don't miss the pain aspect at all. Anyway, I noticed in the book's photographs that, in Balanchine's version of The Nutcracker, Marie (who was always known as Clara in our version of The Nutcracker, growing up) and the prince leave The Land of the Sweets in a little walnut-shell boat. Why don't they have that little boat in the current production? Much better than a sleigh, in my opinon. Well, I've got walnut shells. We pick them up in our neighborhood where the squirrels drop the shells, already halved, so we don't need to struggle with a nutcracker (New Yorkers feed walnuts to squirrels. And our dogs wear coats and Halloween costumes. Yes, it's a different world out here.) and lightly spray them with gold spray paint to make little walnut ornaments like the ones my Grandma used to make. Out came the hot glue gun, some toothpicks, and glitter. Now we've got a little flotilla of walnut boat ornaments. Or is it an armada? I have no idea. So Merry Christmas! I'd like to give away a handful of walnut boats to celebrate the holidays, and if you leave a comment I'll do a quick drawing sometime in the next couple of days and hopefully sail a boat in your direction to arrive right around Christmas. Thanks for coming along with me on this little 2008 journey. You float my boat! Hi. I found your blog through the Oliver + S blog. (Your patterns inspired me to learn to sew- and I thought I was a helpless case.) I enjoy your writing. I also really love those little walnut boats. If I don't win your drawing, I may try my hand at those, too. :) Thanks for being inspirational. That's such a sweet idea! This seems like a really fun craft idea for kids. I know my boys would love teeny tiny walnut boats. I think this is the most precious little ornament I have seen in forever and a day! I do plan on trying to make them, too. Thank you ever so much for this inspiration. Bless you! I would love to have one of yours! Lovely! And like Kristen, if I don't win the drawing I'll have to try and make some too (well, even if I do... a boat on its own would be lonely). I love the patterns, and just like the clothes the boats are adorable! I have never heard of that book, but I'll have to check the library. The ornaments are adorable! Such a neat idea! Oh, they are precious! Love them! I can't ever get enough puns and silly jokes. . . I would have made a "float my boat" joke too! I just read a version of the Nutcracker that has Marie and a walnut boat to my daughter the other night. She kept correcting me, "No Mom, her name's CLARA!" So, there you go! So sweet. I like reading the sails. I love these! When I was little we made little walnut mangers in Primary with those tiny plastic babies (we swaddled them in paper towels then - we were probably 6!) around Christmas time as we were told the story of the Nativity. While I still love those, I think the boats are really cute and I might just have to make some! But wait! If you send me one, I'll save SO much time! How darling! What a cute idea!! I also found your blog through Oliver + S. Your patterns are so so so beautiful! I love them! Those are beautiful! My father-in-law has a walnut tree. I'll have to go scrounging for some shells. Thanks for the inspiration! I love the little walnut boats! I love the walnut shell boats! The sleigh should only be used as transportation out of the snow scene! I danced in the nutcracker for 8 years, and half of our tree is covered in nutcracker themed ornaments I got back then. I may have to find some walnut to get half shells from. Oh my goodness, I LOVED that book when I was little! My sister and I read it so much that the binding fell apart. We also had A Very Young Gymnast, which was interesting, but we were dancers, so the ballet book was favored. Anyway, love the ornaments! Lovely! I'm marking this on my to-do list for next holiday season-- these ornaments are SO SWEET. I would love to win one! OK so New Yorkers are from a different planet. Here in the South we only feed the squires pecans and dress our dogs in rain coats (so they don't get the floor all wet. Oh, those are lovely. Happy Christmas! I agree with you about dancing en pointe! that is when i decided that modern dance was for me. now i am going to be on a look out for walnuts. Oooh, they are lovely! I love that your blog is always such simple inspiration. Not, "ooh, I could do that but it's so much work!"... more "hey, that's a great idea, simple with a bang, I should make one too". ...but if you are offering to send me one instead of me making one, I won't complain! Oh I LOVE this. how very sweet. I'd love one. 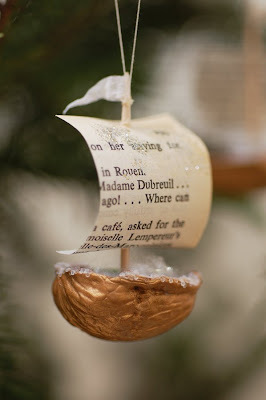 I love the detail - who wouldn't want to sail away in a boat with literary sails and sugar sprinkled on it? Wow! They are the cutest little boats. I'd love one. I like floatilla. Armada sounds like they might take me hostage, lol. Although, if they take me hostage to your house, it doesn't sound so bad! =) I love these so much! I'll be linking. Oh my goodness, I hope I'm not too late to put in a comment for these. I was checking my flickr favorites and saw your walnut ornaments and...oh my goodness I love them! I wonder what I could substitute for walnuts (being in SoFla). Maybe little baby coconuts. Maybe not. I'll probably end up in the hospital trying to crack one in half. Oh, I would LOVE a little walnut boat. I have a relative that sadly just had to sell his rickety old sailboat, and I bet he would really appreciate a wee walnut boat to hang on his tree. These are adorable! Such a clever idea too. Those are so sweet! I'm going to struggle with a Nutcracker and make a few this weekend! Thanks for this! I have an old walnut ornament from the 30s in my family, and it has two tiny people under the covers, a walnut bed! It too, is adorable, but this is an amazing idea. Thank you for sharing! How cute! I really hope I win! This is such a good idea! Wonderful ornaments! I have been reading your blog for a little while and you are such a talented person. Can't wait to see your creations in '09. Ahhh! 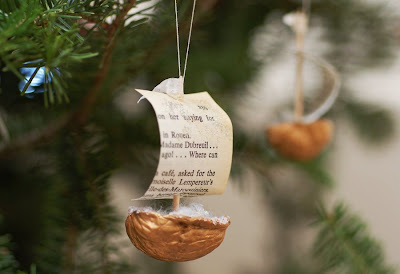 I love tall ships AND walnut ornaments (esp gold-painted walnuts!). A perfect marriage. I love the little boats! I remember making similar ones for floating in the sink as a child!! Weren't as posh as to have literary sails though! Oh, I love this post! Not only did my sisters and I ALSO have that book and take ballet as a result, but our mother had us make those delightful walnut shell ornaments each year--what a sweet memory for you to bring back for me! Wishing you well, as well. I love boats. And walnuts. And Jill Krementz (did you know she was Kurt Vonnegut's wife?). My sister was obsessed with "A Very Young Gymnast" when she was a child and did cartwheels pretty much constantly for several years, including in front of the TV when others were watching. Fun times. Oh, you've made my day! I used to be a ballet-enchanted little girl, but because I was chubby (as were the 2 other little girls who rode with me to ballet class), we didn't get any encouragement from the teacher. I love the little boats -- we used to make such things when I was little (in the 1950s), though we filled the shells with melted candle wax instead of hot glue, and we didn't bother to paint them. Yours are so much sweeter. Here's an idea -- what if you wrote little special messages on the sails and banners (made out of plain paper?) It's not as "re-cycle" as using book pages, but a neat idea for personalizing them. Those are amazing little boats. I just love them! I do know that book well and, in fact, was just looking through it the other day with my son who was in a local production of the Nutcracker. I was wondering what ever became of the girl in the book. Oh! I had that book as well! I LOVED that book. When I went to the Nutcracker for the first time, I knew I wanted to be a dancer. I took ballet too, I think for 6 years. I never made it to pointe shoes (sad) but my toes probably thank me. Thanks for this post, it brought back a flood of good memories for me tonight! I am so glad that someone else (or someone elses!) loved that book as much as I did. I think my sister got A Little Gymnast. She loved hers too! Thanks so much for the inspiration. The boats are way cute! Oh I love those, I am putting walnuts on my shopping list immediately, they are absolutely entrancing. So cute! I will make my own right now! I LOVE that book. My sister and I followed the entire series! I think that my favorites were a tie between the one you mention and A Very Young Gymnast. Ahh, I miss those books. I'd forgotten all about that book, but I used to absolutely love it! Thanks for reminding me! The boats are very sweet. Merry Christmas! Love the walnut boats. I love handmade ornaments. I really want to make some for my self. All I need is gold spray paint! Hi! I just found your blog today via Craft Magazine's email...these boats are absolutely PRECIOUS and I really haven't seen anything like them before! Why should I win a boat? Because I not only have A Very Young Dancer on my bookshelf right now, but I also have A Very Young Gymnast as well! What a cute little boat!! So sweet!! Hmmm...I might have to go on a search for walnut halves now! Those are so adorable and my boys would get a kick out of making some. Thank you so much for sharing! Where have I been? Seriously. Had NOOOOo idea I had missed all these recent postings. First, my sister and I get together each year to make cookies with the kids/cousins for the very same reason (2 adults=more fun? ), Second - brown wrap? Are you kidding? Really - you do that, too? Great minds think alike. (hehe) Although, Tsia must be more clever because the white crayon idea was DARLING! I really enjoyed your Baby Jesus book posting, too - that book looks very much loved. Although, my curiosity has piqued with your dad going to Antarctica - that sounds intriguing!!!! Do tell! Well, I've now posted a blog on your blog so I'll close. Merry Christmas, Liesl! I love these. I would love to make them my daughter's ornament from this year. Oh thanks for the giveaway and the inspiration. I LOVE THESE!!! How cute!! My uncle owns a walnut farm and I made the balls from matha stewart you can check my blog if you are interested!!! Nooooo! I'm too late!! However, I would love it if you did a tutorial on these...perhaps next Christmas? They are just lovely. That is so CREATIVE & cute! Send me a boat please! I just have to have one. The are a wee bit magical. I want one do bad. I will post my address right here! Very cute. I think they would be a wonderful Christmas ornament to make with my grandson.